Rejection causes damage, for sure. Whether we know it or not, our inner being is extremely vulnerable and does NOT want to suffer at all. If it has been hurt, it must protect itself, either by beating back or by building prison walls around the hurting heart. Let’s say, someone has been rejected very often in their life and does not want to be hurt again. What will they be inclined to do in order to not be hurt again? One possibility would be to avoid human contact and to live a lonely life where nobody can hurt you, but where, alas, is no one to comfort you when you’re sad. No encouraging word to lift you up, no tender correction when your thoughts make you feel depressed or even desperate. Indeed, if we are completely alone with our thoughts and have no one to share them with, the possibility to choose the wrong ways in life will be way higher unless…..yes, unless we have the best Counselor possible, the Holy Spirit who leads us into all the truth. If we indeed experienced rejection very often in our past life, God will heal our wounds and lead us to brothers and sisters who will love us “through it all”. They will love us despite our mistakes, failures, overreactions or any other imperfections. We may learn from one another in such fellowships and we may carry the other when he or she is weaker just as the others will help us get up again if we stumbled and fell down. We are all human and it is allowed to make mistakes, once, twice, three times, every day, thousands of times because the Lord is our righteousness. We might be self-righteous or malevolent, suspicious or resentful, cold-hearted or loveless. Actually, that is not our problem since Jesus came to set us free from that OLD SELF. Although the old man/woman basically died with Him on the cross 2,000 years ago, the reality of dying to our negative and sinful flesh must be experienced in our own life – today, now, every day a bit more. To be honest, it is not enough to say, “I have been raised with Christ and now I am a new creation,” if there is no evidence of it in our everyday life. Finally, compared with our old self, how does our new self love? He will even make us love those who do NOT love us in return. Do you believe this? Yes, Susanne, I believe it and I know you do too, because he is making all things new and giving us a new heart that loves as HE loves. Amen, we both believe it, Michael. Indeed, I cannot say that I ever loved my life nor my old self since I have come to know Jesus better and better. But one day when all those dying pains have come to an end, the miracle of eternal and new life begins to shine even through us, more and more. This is my great hope, the hope of resurrection life already here on earth. As you know, I have had a life filled with rejection. It started out when I was one year old when my Father rejected me. I spent many years trying to figure out what I had done wrong (or was doing wrong) so I could fix it and be acceptable again, all to no avail. When he died at 72 he was still cold and distant to me and my younger sister. Yes, Michael, that is true, I only do re-postings on Facebook when God shows me to do it and I can tell you that I had no idea that this one would hit close to home in your case. God’s thoughts indeed are way higher than ours and His thinking and doing remains a mystery for us. I am so sorry about the early rejection in your life and about those many, many rejections later. 😦 Thank God, who is able to do the impossible, He heals our old and deep wounds over time. You’re very welcome, my dear brother. I am glad if someone has been blessed by what I did or do. But I know it has nothing to do with me since I am an empty vessel with a blank mind unless the Lord fills me up. So, it is all His doing, basically. Jesus had been ditched by His beloved disciples, who fell asleep when He was emotionally most in need, and specifically asked for their support at the garden of Gethsemane. But because Jesus’ need for love was completely fulfilled by our Heavenly Father, He was free to love, despite of the disciples’ incapacity to love. Jesus had no resentment towards His disciples! Thanks for the article! We can all relate! Susanne, thank you for this post. The new man is in my heart, I think. However, it has not been tested. My pray is to pass when tested. PRIDE.NOT RUDE OR UNMANNERLY. DOES NOT INSIST ON IT’S OWN WAY. NOT REJOICE IN INJUSTICE. v 7: BEARS UP WITH ANYTHING THAT HAPPENS. READY TO BELIEVE THE BEST OF EVERY PERSON. Oh, Herbert, that is really great!! Thanks so much for sharing this Bible translation of 1 Corinthians 13 – excellent, indeed!! YESSSSS!!! That is my very opinion and I always try to do it (with God’s help, of course). This has great significance for the victims of abuse. I have more than once had a victim tell me her plan to shut the world out, in an effort to avoid further pain. That fear can run very deep. But the price of isolation is too high. Only grace can enable victims to pray for their tormenters. Indeed, Anna, you hit the nail on the head, since I was actually thinking of abused women when I wrote about fleeing from the world and particularly from human beings. Some women – understandably enough – prefer living with animals rather than people after such deeply painful incidents. You know Susanne I saw this article yesterday but I was so incredibly tired I could not take in all that you said but you see the picture you put up and I love and relate to pictures very much (the artist in me perhaps) stayed with me all day. It made me smile because also I thought how true this is. God gives the sunshine both to the good and the evil. I was reading about Judas in my daily reading yesterday and was struck how God loved Judas even though He knew the outcome. Even though he was perhaps the last to be chosen of the twelve, he was chosen. I always feel very sad about Judas and I’m sure that Jesus does to. I have known many Judas’ in my time and they are usually the ones closest to you – isn’t it amazing how really Jesus knows and has experienced all that we go through. I know when I had to forgive my mother on her deathbed despite even her hurting me up until she died I know I would not have gone if Jesus hadn’t asked me to go. Note I say ‘He asked me’. He didn’t force me, I could have said no. In my own selfish way I had every right to say no because of so much hurt. it was not easy at all meeting family I hadn’t seen for over a decade brought up many not very nice thoughts. But Jesus took me just where I was amidst anger, hurt and saw me through it. Isn’t this just what He does. We can do nothing on our own at all, absolutely nothing yet He continues to love, heal, speak with us! Could we do this? No I couldn’t do any of it without the love of God in my heart. Without God I know I could not love or do the right thing. Sorry it’s so long it’s just so good to feel a little better today but your picture Susanne what a gem!! I love it! 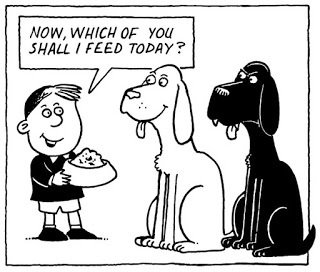 It speaks volumes to me as I have a dog and a cat and feed both! If I have tuna they have to have tuna! I can’t miss them out of my treats! What you wrote about your experience with your mother on her deathbed touched me that deeply. How terribly difficult must that have been for you, such a situation, even after that painful childhood you had to go through. I do not know what to say on this…..
You know I can relate to being incredibly tired as I told you yesterday in a short email and that I always (ought to) take my time until I have recovered. I already told you that I loved your comment above that much because it was so inspiring, In fact, yesterday I was not sure about on which of the issues you mentioned I should reply to you. On the Judas Iscariot subject, on humility that increases the closer we get to God, or on cats and dogs. 🙂 Meanwhile I think I am going to share my Judas experience with you and others who might read it. As Jesus came more and more fully into my life, He not only freed me from reading books but also from any interest in this world. So, more than 6 years ago, I also stopped watching TV, feeling more and more bored with what I loved to watch before (World News and weather forecast ;-), documentary reports and even Christian stuff). One evening I had just been watching a documentary report as I felt nudged to pray. I lay down on the couch in the living room, however, the TV was still on and I heard some blah blah in the background. As I closed my eyes, I was immediately reminded of Judas Iscariot and felt so deeply touched by his fate that I began to sigh and pray wholeheartedly, asking Jesus WHY that had happened to him. What was the difference between Peter and Judas? Weren’t all of His disciples sinners before they got converted? Knowing my own Judas heart, who but God could have saved me out of my many sins? I was weeping and crying to God for Judas’ salvation until I suddenly felt that my prayer had been heard. I read this yesterday Susanne but again another bad day so tired and I wanted to reply but knew I would not give it justice. I am always amazed at how the LORD gives us answers that just ‘suddenly’ appear out of nowhere but of course God is closer to us than we can ever believe. I was baptized with my sister but when I saw her on my mother’s death bed the LORD told me in my confusion that she did not believe. I can remember her saying and I was shocked when I told her what the LORD was doing in my life ‘Oh’ she said ‘I can’t be bothered to bring every little thing to Jesus’. It was the way she said it. I was totally shocked. and as I looked out my window which was to a view of such beauty I asked LORD ‘what has happened, where is she?’. He replied ‘She doesn’t believe’. Since then the fruits of her unbelief have shown more and more and my mother a believer but the LORD said ‘she never let go of her idols’ when I asked did she go to heaven. Her idols were money just like Judas. As to your comment on freeing you from books I can really relate to this. My idol was the library since a young girl. I have read hundreds and hundreds over the years spent a lot of money on them but now the only book I read is the bible. To be truthful it is the only one I want to read. My daughter loves books too I hope one day she will come to love the Bible. I’m not sure if I have given your reply the justice it deserves Susanne but I do love to communicate and I know those who come to your page read your comments too!! Very unusual and rare! It’s good! Like you though I like to go away and think and reflect on things much more, chew it like the cow chews its cud producing meat though not milk ha! When you feel so tired, please, do not feel obliged to reply at all (BTW – same here – awful night…nauseated…head ache and then some 😛 ). Somehow I envy people who can always sleep deeply without any problems. As for the situation with your sister at your mother’s deathbed…well…..I do not even dare to imagine how you might have felt at that moment. Confusion is so much part of our journey, indeed, particularly when strong emotions are involved. Without being able to convince you that I believe your mother is in heaven and that your sister’s salvation is no problem for our loving Saviour, either, I think I could share another testimony with you. In 1996 it was already one year that I attended a Christian Pentecostal cult and there we were told that everyone who did not believe as they did, that is, all who had not confessed Jesus’ name publicly before death would not be saved. Period. They only took the second part of that Scripture and made it a law. Can you imagine how big the fear was of all those who believed that rubbish and whose closest relatives suddenly had to face death? They would even go paranoid about it, confusion at its worst!!! Indeed, that was NOT the fear of God they might have had, it was Satan who had deceived their hearts and kept them imprisoned in the most awful anxiety. In springtime of the year 1996 my hubby’s stepfather was facing death as well. He had a long agony to endure and those in the cult, of course, “knew” that such things were “God’s punishment”, even a foretaste of hell (I could still vomit when I hear such stuff today – godless deception!). Actually, though not knowing our beloved Saviour as well as I do today, I felt immediately that they were completely wrong. But I couldn’t tell HOW I had come to that conclusion. One evening I hit the shower and without thinking about it, I suddenly felt the spirit of supplication coming over me (while washing my hair 😉 ). At first I had to weep a lot and I felt my father-in-law’s painful physical struggle for a few moments and at the same time the deepest compassion possible. What a love Jesus felt for him – waaay more than I could take – and perceiving this as doubtless faith in my heart, it made me weep all the more. Before I left the shower, I was enwrapped in eternal peace and the assurance of my FIL’s salvation. Shortly afterwards, my MIL called and said, “Gerhard fell asleep, finally – peacefully…” I could not have been happier about it and courageously I shared that testimony afterwards publicly in the cult. I told them that God was not as strict as they taught and that He was willing to save EVERYONE. He alone knows our hearts and only He knows why people might have problems with faith during their lifetime. If someone understands them, then it is God – and Jesus. In fact, experiencing my own faithlessness in several areas of life recently, has eventually helped me see that God does not need “my” faith. I only need that faith that comes from Him and then everything else is fine. By the way, I never heard my father-in-law say ANYTHING about faith, nor God, nor Jesus. He was as quiet as can be about these things. It is the heart that matters, not necessarily what our mouth confesses since the mouth can lie, the heart can’t, at least before the eyes of Him who is LOVE. I believe that God does the greatest miracles of salvation especially on deathbeds, although His doing is often invisible for those around us. He is a God of little things, not of spectacular miracles. And the greatest miracle of all is the salvation of the sinner, isn’t it? May God bless you immensely, my dear sister!!! I also had a similar deathbed experience. My aunt was dying of cancer and spent her final days in her home. I was not called until she had slipped into a coma and I found out that my father had been there for a week from 900 miles away without calling me. Well, my wife and I went over to see my dad and aunts and uncles at her house and she was lying on the living room couch and looked like a shriveled up 90 year old Indian woman. Cancer had decimated her body. The rest of them were crowded around the corner in the dining room and kitchen. Looking death in the face is too much for most people. Anyway, after saying hello to them all I felt that the Lord wanted me to kneel beside my dying aunt and speak words of faith to her in her comatose state. I told her that Jesus saw the suffering she went through all her life and that He loved her and wanted to take her home with Him and kissed her on the forehead. At that moment a beam of heavenly light came down from over my left shoulder and shown upon her face in a flash. I watched her body jump when it did and then I heard crying behind me. It was my father and his other sister clinging to each other and weeping… they saw it too. Neither of them ever spoke to me about what they saw and felt in that moment, but that was only the second time I ever saw my father cry (the first was when my little brother died). I don’t see a “sinner’s prayer” as a condition for salvation in any of this passage. We have been reconciled to God by the death of Christ on the cross while we were yet God’s enemies, not after we sign a truce! And we are SAVED BY HIS LIFE. John wrote, “In Him was LIFE and the LIFE was the light of men.” I believe His LIFE came into my dying aunt and saved her by HIS sovereign act of love for her as she lie there dying and I will see her on the other side in her perfected body. Love to both you dear sisters! Thank you so much for sharing that awesome testimony about your poor aunt’s salvation on the deathbed and thank you also for the following words that directly came from God as my heart strongly confirmed. Also, YES and AMEN to the following creed. Meanwhile I experienced that in similar cases, often while I was not able to be at the deathbeds of (not only) relatives and I always got out of the blue the confirmation of their salvation engraved into my heart. No doubt possible. Finally, we walk by faith, not by sight….. SINCE THIS HIGH INCREASED WITH SINGING BIBLICAL BASED SONGS!? AND LACK OF CONCENTRATION KEEPING ME FROM PRACTICING MEDICINE. I WENT TO THE HOSPITAL WITH BIPOLAR DISEASE. Of course, I experienced FATIGUE WITH LOSS OF SLEEP as part of my work. So, I cannot use fatigue and loss of sleep THAT IS MANIA.. LIGHTS AND OTHER COLORS WAS GREATLY INTENSIFIED. Although I suggested to you yesterday that I would answer to this particular comment via email only, I was praying over it once again and wondered whether a response to your question might also be interesting for those of my readers of who I know that they suffer from bipolar disease as well. So, I will try to share my thoughts on that difficult subject on here. I assume what you described as your teen experience as an emotional high followed by depression was certainly your first bipolar episode. However, that does not mean that you had no spiritual experience with God. God is Spirit and He indeed often meets people who are mentally sick in the midst of their emotional confusion. To really try to discern what of the whole episode was spiritual and what only emotional will eventually leave you more and more confused as I know from my own experience. Asking (Christian and other) psychiatrists about it didn’t help me either because the non-Christian therapists, though mostly very understanding, knew bipolar disease only from their books and patients (from “the outside”, that is), however, not from their own experience which would have helped so much. The Christian psychotherapists might have a similar problem when they try to arrange the disease to fit with what has been written in the Bible. So, you won’t probably find any expert on mental sickness who did not yet suffer from it himself. What helped me, finally, to deal with the problem was the starting point of healing in 2005. I realized that I had to accept the disease as GIVEN BY GOD. Both the emotional highs and particularly the depressive lows had to be embraced as, “My Lord, Thy will be done.” Thus slowly the first healing set in. Afterwards I lost more and more interest in experiencing emotional highs and the emotional lows flattened out over the years until they were gone (healed). It was a process and it still is because God heals the roots of our diseases and it is still painful at times when He digs out another wound of the past and begins to heal it. Yet through acceptance of pain the healing process is shorter than it would be by continued rejection of negative feelings. I hope my thoughts could help you a bit, Herbert. May God bless you and heal you completely! yes many times people in my life have turned against me and still I love them–there is only one answer to this mystery–Gods being inside of me. I fully agree that it is God at work perfecting us. However, we do make choices in the paths we take. He has given us free will, and does not “force” our obedience. His grace simply makes it easier for us to overcome our sin nature, and make the better choice. That, at least, is how I understand it. Whether it’s actually of Indian origin or not, I don’t know. But I do think there’s an essential truth captured about our divided nature. And an important lesson. We must not be so discouraged by our failures that we give up the fight. Though it seems paradoxical to the idea of free will, we must trust that God will carry us forward to walk in the good works He has ordained for us. I do like that quote by Lee Strobel as well, Anna. It reminds of Ezechiels’s vision of “The Valley of Dry Bones”. Yes, it is a fight at times which “dog to feed” and we usually face many of these choices every day. His grace indeed helps us to make better choices and to more and more gladly obey out of love for Him and others. That was beautiful, Susanne! The Lord has been exposing my failure in this area, but He is faithful to complete the work that He has begun in my life, and in others. The Lord’s love shines so strongly through you in every blog post ♥. EVERY BODY) : HIGHS AND LOWS SHOULD GET LESS & LESS. The truth of this is , I believe.I am experiencing this. I am told that for those with bipolar disease many have MANIA only on occasion. However, what I saw was that all who suffered from that disease made spiritual experiences that reached beyond anything they knew (felt, sensed, smelled, saw, etc.) before. And these experiences were rather similar for all of them, be that Christians or non-Christians. But tell a psychiatrist about it, they will either shake their head in surprise or tell you that your “spiritual” experiences were only symptoms of the disease. Without God I would have never realized that there are indeed blurred boundaries between the realm of the spirit and our “normal” realm of body and soul feelings. I haven’t had serious episodes of mania since the beginning of 2013 (and have been medication free since the year 2000, except for an occasional anxiety pill to help me sleep). I did feel quite depressed at the last months of that year because I experienced the ultimate disappointment with Churchianity. Now I’m rather apathetic about spiritual things, and I haven’t had a real experience with God for months. The only positive thing I can say about my spiritual progress is that successive failures at anything resembling sanctification or a personal ministry have made me much less judgmental and more humble and loving. Since I know I’m no example, I tend to tolerate people’s faults more readily. And while I disagree with the way man has organised church and don’t really want to join yet another “fellowship” to be let down once again, I do not judge, let alone feel resented against, pastors or brothers who are still in the system. I have a former brother in the faith who left the system and is so full of hatred that I can’t talk to him anymore. Sad because he and his wife used to be precious people, but trying to reach out and let him see judgmentalism is poisoning them has been an utter failure. I so agree with your tip to accept these mental issues as part of what God has allowed that we bear. This did help me. While I have to be on the lookout for flareups, I’ve almost been fully healed and when something resembling my former sick self comes again, I thank God because it could have been much much worse. Thank you so much for your rich, deep, and wise response. Your testimony, I am sure, can help many who read it. Meanwhile I wonder why not only a few people who are/were bipolar meet on the internet. Maybe because there they find others who understand…..? Ouch – as high as Peter might have felt before, now he was humbled – deeply. In fact, Satan is God’s instrument to humble us continually, to wear the old self out until we are fed up with being how and who we are in our carnal nature and cry out to Him for His Spirit to make us completely new. And that is a process, indeed. Thanks again for your precious comment, Carina. I am glad that God helped you through so many difficult times and that you know how to deal with flare-ups, just in case the disease tries to rear its ugly head again. I would be glad to read more comments from you in the future if you like. Your reply was a really helpful contribution, both a confirmation and a wonderful testimony. God bless you two sisters. I know from reading Susanne’s postings on here that we are all three tracking right along together. You two have blessed me in what you have shared. I am sorry to say that I have not arrived to this place, I am still in a world of hurt and alone for the most part. But, I can say that I am dying out and drying out in this dry and very dark time. Your words do bring me some comfort and a much needed insight as to what my Father is doing deep within me. Thank you for this my friend. You are so welcome, Susie. Yes, it is a long way with many ups and downs. And hurting because of dying out and drying out is anything but pleasant. I know times when nothing can give me any comfort, neither what I read (in the Bible or elsewhere) nor the presence of God. Actually, when His presence only causes pain, I would love to run. But where on earth could I hide myself where He has not been before? So, the only thing we can do is to pray for one another and thus to try to carry our brothers and sisters through prayer into the brighter times that lie ahead of us. My dad & my family : 4 kids.All in our were full-time Christians. We all except Mom, had mental problems. Dad, me, a sister, & niece were bipolar. In 1945, we lived on a farm in East Tennessee, Dad was an important Christian in his church. He was stressed with it because of a problem with the pastor. He had a fatal manic episode with a psychotic reaction. The only other time with him with mania was at time he suffered fractured both arms. Mom said that he wanted to be a Christian missionary. I am so sorry to hear of your family’s mental problems, dear Herbert. I will take that prayer as well, please Susanne!!! What more can I say that isn’t already said?! Thanks so much for your wonderful comment, dear Ngozi – so humble and loving. ❤ You really encouraged me today, my sister! And I will keep praying for you too!! Promise! No, YOU just encouraged me with your reply because you ,indeed, found some good out of my comment, which I posted out of resignation and fatigue. Truth is I can relate to all that has been written and much more. Was wondering if i had the energy to post a similar comment when your last comment inspired me to write mine. We all need prayers. I will be praying for you all brothers and sisters. Please remember me in yours. it is a dying and drying time indeed. Lord help! Oh Ngozi, it seems to me that it was also what you didn’t say explicitly, but what I sensed your heart telling me while reading your reply and I tried to answer to what I perceived. I will keep you close to my heart in my prayers, for sure, and I believe others will do the same when they read your response on here! Together we’ll make it…alone we can’t take it! …and AMEN to your prayer dear Susanne. Thank YOU, dear Ngozi! May you be blessed immensely!!! This goes along great with a video I watched yesterday. The guy on there was so loving that even when he got hit in his brand new truck he still had love and compassion on the lady that hit his truck. He was saying he is showing Christ in him self that way. Hmm… Not sure, but if someone points to Christ in himself, that must be the old self, I believe. Self-forgetfulness is the goal, which comes from beholding Him, not from admiring oneself. I do not believe everything I hear or see. We truly need his spirit to discern the truth from the lies. ya and I will admit I have trouble with that. which is why I get confused a lot. I get far off track and I get nudged back on track. Thanks again.